After the 1958 to 1960 "rugby style" shirt, the new 1960/61 kit for United's return to the top division reverted back to the more fashionable V-neck style, but kept the simple design from the previous kit. The new short sleeved white cotton shirt kept the double black band around the middle, but this time had a black V-neck and matching cuffs. The DUFC Shield that was introuduced in 1958 remained, placed on the left breast above the two bands. The shirt was accompanied with white shorts with a black strip down each side, and was worn with a variety of sock styles including white socks with black trim, red socks, and black socks with red tops. 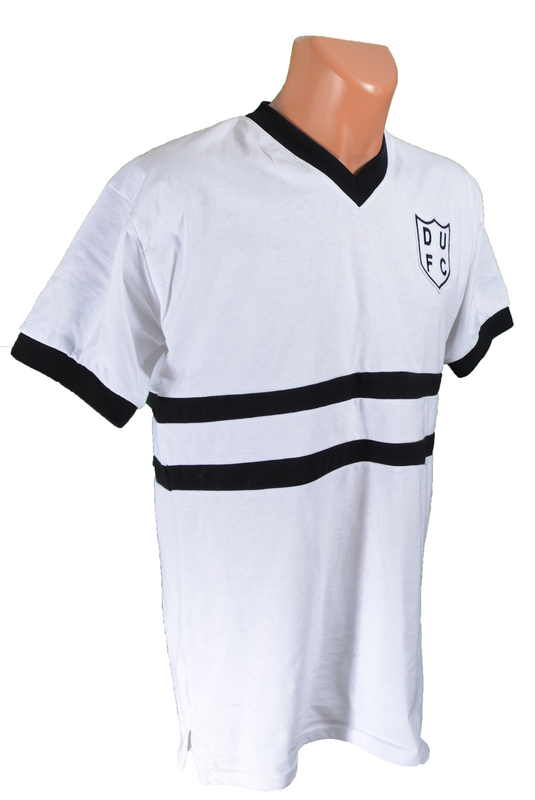 This was the kit worn while United solidified there place in Scotland's top flight after promotion in 1960, and was worn right through to the summer of 1963 for the Club's tour of South Africa. During these early years back in the First Division, the previous long sleeved rugby style two striped shirt was occasionally worn during the colder months. We believe this kit would have made its debut in the opening match of the 1960/61 season, a 2-1 away win over Stirling Albion in the League Cup in August 1960, but this is yet to be confirmed.